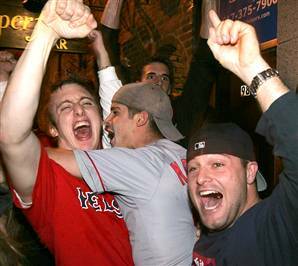 Red Sox Nation cried, smiled, and celebrated on October 27, 2004. October 27th marks the fifth anniversary of the Red Sox reversing the 86 year curse. Damn five years went by quickly (I hate getting old! ), but I remember that night like it was yesterday. It was a crisp clear autumn night with a full moon. I was meeting all my friends at the Grand Canal in Boston to witness arguably the most exciting, incredible, and unbelievable moment in Boston Sports History. The Red Sox were on the cusp of finally Reversing that f@$#@*& curse! However, let’s step back and rewind back to the ALCS versus the hated Yankees. After dispatching the LA California Angels of Anaheim at Disney in the Divisional Series, the Sox sputtered and were left for dead after a 19-8 thrashing at home. They were in a three games to none hole. Everyone in Red Sox Nation began to focus on the Patriots, Bruins, and Celtics (If you really thought they were coming back from down 3-0, you are a liar or a psychic). Baseball season in Boston was over.